Health care facilities are among the most Googled services out there, so it’s only natural for doctors, clinics, and practitioners to invest in building an appealing online presence. From personal experience, a great website can convince potential patients to reach out and book an appointment; while an outdated and incomplete web page will make them run for the hills. Or, you know, to another clinic at least. To help you put your best foot forward, we’ve gathered a list of the best medical health WordPress themes of the year. Read on. 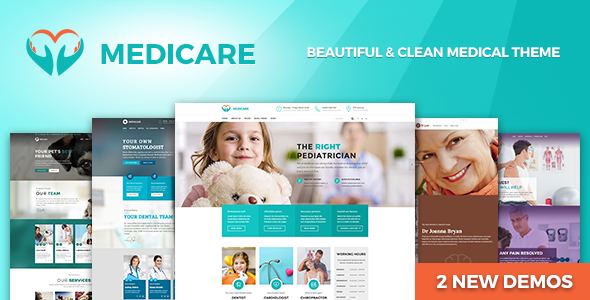 A WordPress theme specifically built for health, medical, clinic, dental and veterinary service websites, Medicare offers a posh design, a drag & drop page builder, and a cost calculator that will surely come in handy. The theme has a comprehensive options panel, unique page transitions, and distinctive typography. It comes with free updates and free support, so you will have someone to reach out to if you’re having any trouble setting it up. The last entry on our list of the best medical health WordPress themes is MedicalDoctor, a clean, flexible, and responsive theme meant to appeal even to the most demanding healthcare professionals out there. MedicalDoctor is loaded with useful features and has powerful customization options. It’s very quick to set up and easy to tweak, thanks to its intelligent admin panel. Moreover, the theme comes with a built-in timetable and a drag & drop page builder and includes the Layer Slider plugin. MedZone PRO is one of the best medical themes on WordPress and will amaze both visitors and users with its features and design. MedZone PRO is highly customizable, extremely easy to use, fully responsive, well designed, and user friendly. With MedZone PRO you have the options to change the typography, colors, footer widgets, blog layout, post format, and much more. Also, you may add unlimited front-page sections that include testimonials, appointments, opening hours, hero section, doctors sections, and so on. MedZone PRO is the best solution to provide a unique and refreshing experience for your audience. Check it out! 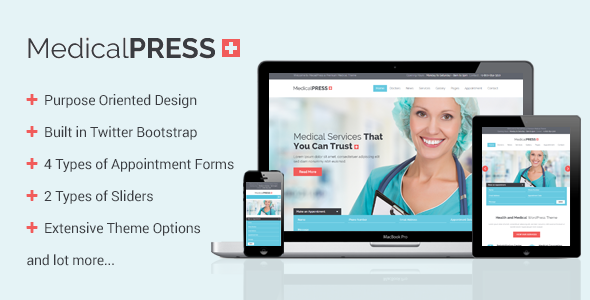 MedicPress is unique & modern WordPress theme for doctors and clinics. Packed with the famous ProteusThemes One Click Demo Import and live editing Page Builder you can have your new site up and running in a matter of hours instead days. With clean code and valid structured data, you will rank higher in all the search engines. 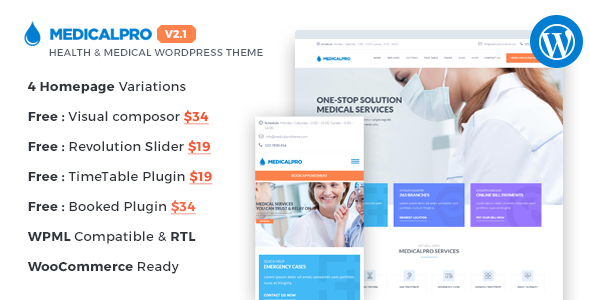 Together with SEO friendly code, MedicPress theme is also speed-optimized and it is one of the fastest WordPress themes available. The theme is also mobile friendly so patients can find important information anywhere, anytime and get help faster. 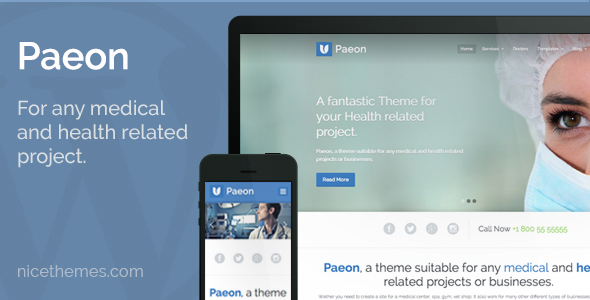 One of the best medical health WordPress themes out there, Paeon was built to impress. With a unique and minimal look, the theme is easy to customize, comes with several page templates to choose from, and includes a responsive slider and multiple widget areas. It’s simple, yet modern and appealing. In other words, perfect for a clinic or practitioner. A multi-purpose WordPress theme offering a clean look and awesome functionality, Dictate can be used for a variety of purposes, including building an eye-grabbing medical site. Its greatest appeal lies in its versatility and ease of customization, so you can launch a fully featured website with little coding knowledge, effort, and time. Visual Composer is included, you have nine medical homepages to choose from, and you get an advanced admin panel you’ll fall in love with. 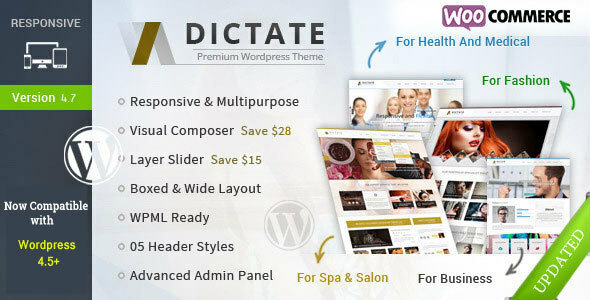 All these features clearly make Dictate one of the best medical health WordPress themes out there. There are plenty of reasons why this professional medical health theme may appeal to you. It features a flexible and user-friendly admin panel. It supports unlimited sliders, colors, sidebars, and portfolios. The theme has a responsive layout and handy appointment form. It comes with a shortcode generate. Plus, it’s pretty, stylish, and insanely easy to customize. Take your pick. Although this theme is suitable for basically any kind of website, it was built mainly with medical practices in mind. Medical Health has purpose oriented design and comes with appointment / booking forms, a timetable, opening hours, department management features. It’s fast, responsive, offers great support, and you can easily customize it based on your preferences. It also has a drag & drop page builder, so updating your site and creating complex pages becomes a breeze. Health Plus packs great value at a reasonable price. It’s a dynamic, gorgeous, and flexible theme that has plenty of features to manage appointment forms, services, doctors, doctors timetables, contact forms, FAQ’s, testimonials, and so on. 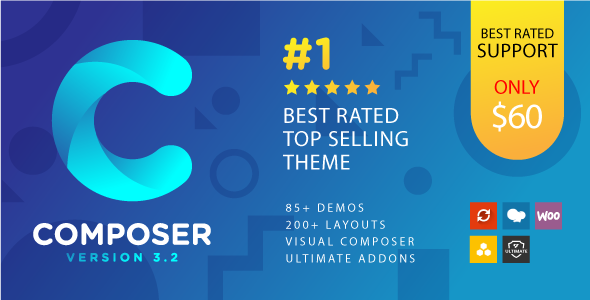 Visual Composer and Revolution Slider are included for free. You will be able to get your site up and running in a jiffy. And it will be a stunning one. This medical WordPress theme is the perfect solution for any type of clinics, doctors, hospitals, dentists, or veterinarians. 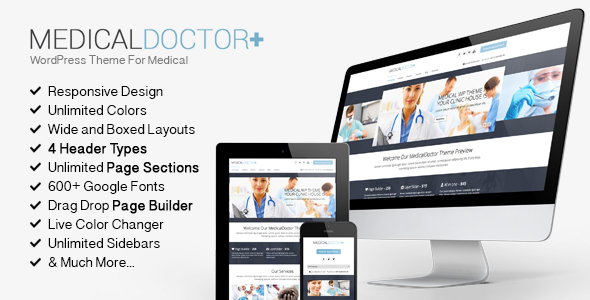 If you are looking for a great and intuitive medical WordPress theme, imDoct is the ideal choice! imDoct comes with a full responsive and cross-browsers compatible design and impressive features such as a fully widgetized homepage, a premium slider included, potent theme options panel, several custom post types, translation ready, pre-built appointment form, and free updates for a year. Check out its live preview to see more! 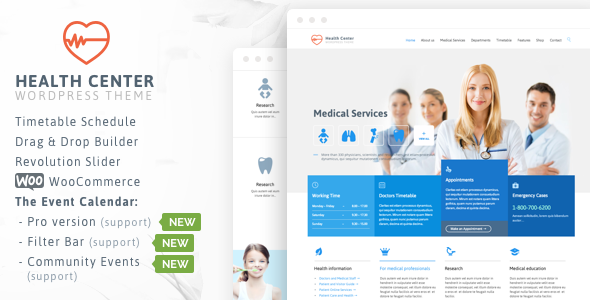 A flat, minimal, and polished theme suitable for anyone who operates in the healthcare industry. 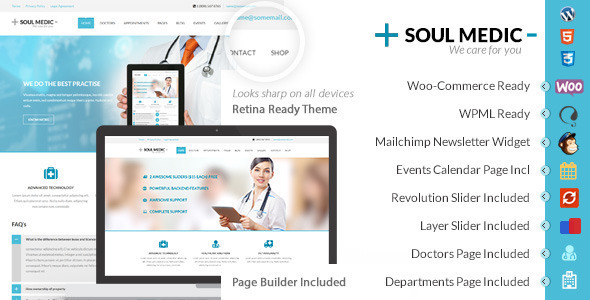 SoulMedic is loaded with more than 25+ different page layouts – doctors, departments, services, blog with comments, about page, events or schedule pages, event detail page, a gallery with appointments, and so on. It has an awesome and easy to use page builder, Layer and Revolution Sliders are included, and the theme supports several popular plugins. Building a stunning website has never been easier. We couldn’t have put together a list featuring the best medical health WordPress themes without mentioning MedicalPress. This sleek theme has purpose oriented design, responsive layout, and special features to manage appointment forms, facilities, services, doctors, gallery items, testimonials, FAQs, news posts and pages. In other words, it has everything a healthcare professional could wish for and more. Visual Composer and Revolution Slider are included; plus, the theme comes with various styling options, so you can put together a page that fits your brand with minimal effort. 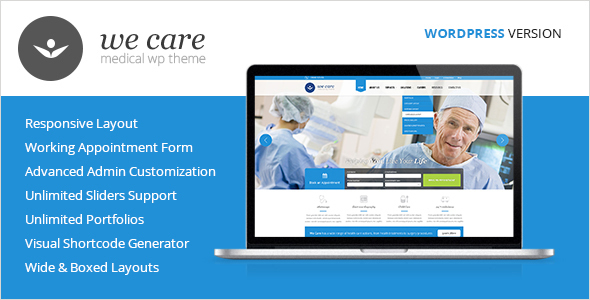 A clean and modern WordPress theme suitable for large hospitals as well as small practices, MediCure has a custom admin panel that’s easy to navigate and a drag & drop content composer that makes content management a true pleasure. It includes the Layer Slider and Revolution Slider plugins, a large collection of custom widgets, and detailed theme documentation. You should be more than able to set it up and customize it to your needs. Infinite is a medical health theme that covers all the essential tools and options all medical websites need in order to be successful. Infinite has a professional design making your services and website seem trustworthy. Upon installing Infinite you will notice just how many features it has starting with a GDPR tool, page builder, high-quality demos, RTL support, auto updates, maintenance and coming soon pages, limitless sidebars, mega menus, custom fonts, portfolio, gallery, and blog layouts. Infinite also comes with a team of dedicated customer support representatives there to help you at every step. 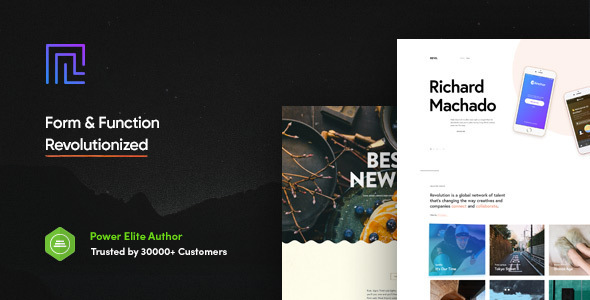 Revolution is a gorgeous, trend setting WordPress theme that incorporates both bold and stunning elements as well as professional and clean ones. While Revolution is a multipurpose theme, it also contains a medical demo designed for wowing and inspiring visitors. If this is not the demo for you, there are others available which you can customize to your liking. 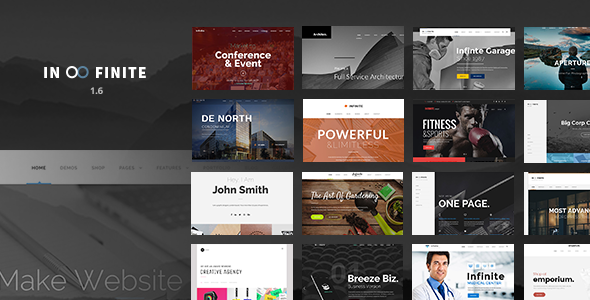 Revolution also provides creative portfolio layouts, listing layouts, shop page, product layouts, adaptive images, speed improvements, and countless header styles. With Revolution you will have no issues creating custom medical and health layouts. This makes it one of the best medical health themes. Finding success in some niches can be really though because the competition is so fierce, and the medical field is one of them. HealthFlex was developed with the help of experts giving you a fighting chance thanks to its original and professional look. 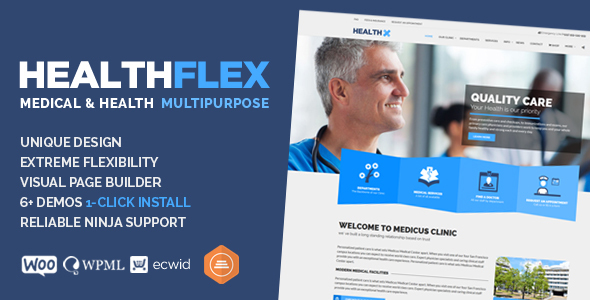 There are plenty of options available with HealthFlex Pro including multiple demos, drag and drop visual builder, unlimited color variations, per-page options, multilingual support, WooCommerce ready, shopping cart plugin, and custom posts. Overall, HealthFlex is a theme worth purchasing! Medical Cure is one of the best medical health themes you can use to promote your services online. If you are not sure if this one is for you, you can take it out on a test drive for free. This gives you the opportunity to see exactly what it has to offer before committing and purchase it. The quality of your website will shine through no matter the customizations you make. 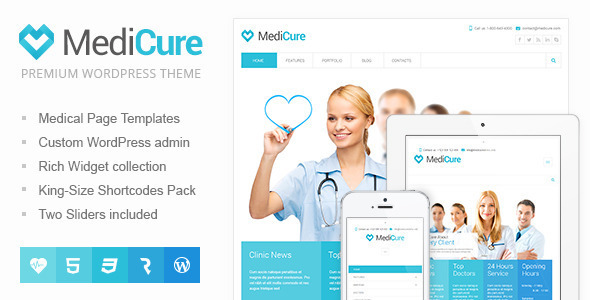 Medical Cure offers a single click installation process, drag and drop builder, 5 headers, 70 elements, 50 inner pages, and 4 blog layouts, just to name a few. Medical Cure has you covered! Composer is a modern and clean medical health theme perfect for crafting professional health related websites. Composer gives its user the chance of testing the theme out before purchasing; this is how confident the developers behind it are. It is a great way of seeing if Composer is a good match for your brand and business. 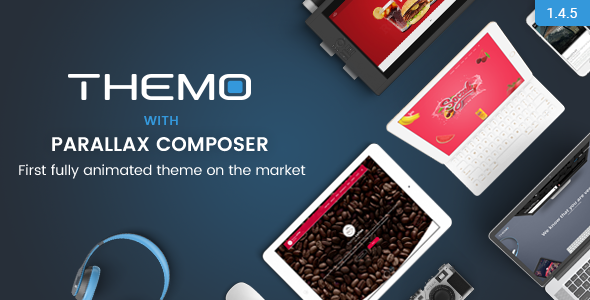 Composer will surely impress you with more than 85 demos, giving you a quick way of launching your medical website. Furthermore, you can user Composer’s blocks to define your own custom layouts. This stylish theme is a complete package and will take great care of you. 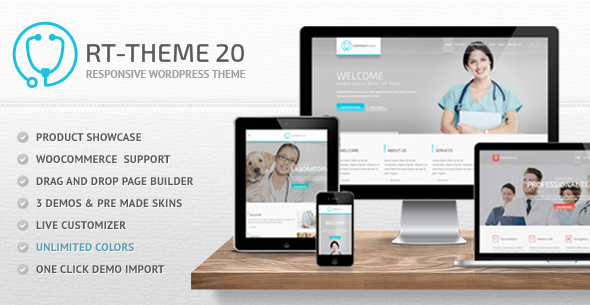 Medical health themes that come included with demo content and homepage demos will allow you to have your website up and running in no time at all, and RT-Theme 20 does exactly that. RT-Theme 20’s main objective is to be a great platform for beginners and advanced WordPress users reducing the time it takes to launch a website. RT-Theme 20 has product showcase, WooCommerce, 3 demos and skins, integrated page builder, live customizer, and more. Furthermore, RT-Theme 20 has a mobile friendly layout ensuring all your visitors are experiencing the best of your website. Pearl might not be marketed as one of the best medical health themes on the market, but it sure is. Pearl includes a large number of pre-designed homepage demos ranging from restaurants and beauty to musical and church. Apart from its impressive collection of demos, Pearl also supports 200 de custom modules, sliders, mega menu, header builder, 800 Google fonts, customizable maps, translations, custom colors, and a one click demo importer. Furthermore, Pearl also is compatible and integrated with the popular page builder, Visual Composer. Themo is a clean, fresh, and innovative WordPress theme that comes with stylish designs and lots of different features. When setting up Themo you can choose to use to import the demo content for a quick and easy setup. There are also various highly customizable homepage demos at your disposal. Apart from these initial settings, you also get advanced page and post options, advanced typography, unique portfolio, fully customizable backgrounds, 6 post types, mega menu included, 2 powerful sliders, premium icons, custom lightbox, and one page layouts. If these features sound good, the Themo might be the one for you! One of the best features all medical health themes should have is a responsive and intuitive layout guarantying that all your visitors have a pleasant and hassle-free experience. OneLife takes advantage of all the technologies available to ensure that it is completely responsive and easy to navigate no matter the customizations made. 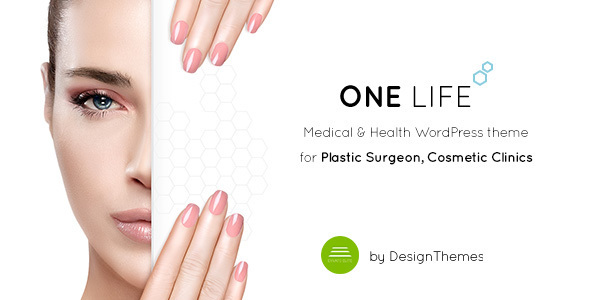 OneLife incorporates 4 modern demos each with its own original layout to help you get started. 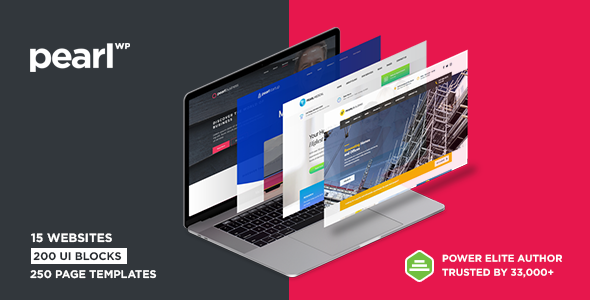 This theme also incorporates 2 premium slider plugins, 10 pre-defined colors, doctor pages, a shop page, appointment forms, and dozens of shortcodes. Don’t look further and get OneLife! Visual experience goes a long way in all industries and niches, and inMedical is a theme that focuses on the visual aspect. Because inMedical has such a beautiful design it is a great choice to represent your medical services online. Of course, inMedical has more than just good looks and it offers a great collection of customizations and tools. Its feature list includes 10 details homepage demos, doctors’ manager, timetables and events, complex appointment forms, shortcodes, Visual Composer, Revolutions Slider, and WPML support and integration. With inMedical you have no limits! Today’s health care market is highly competitive and new websites must find new ways of breaking through the ice and standing out. To help you with this, MedicalPro present a stylish design with great functionality that is a delight to navigate and look at. MedicalPro on itself is a great theme, but combining it with Visual Composer, Revolution Slider, TimeTable plugin, and Booked plugin made it outstanding. MedicalPro has 4 demos and 12 page templates suited for various medical fields. You have to try MedicalPro! 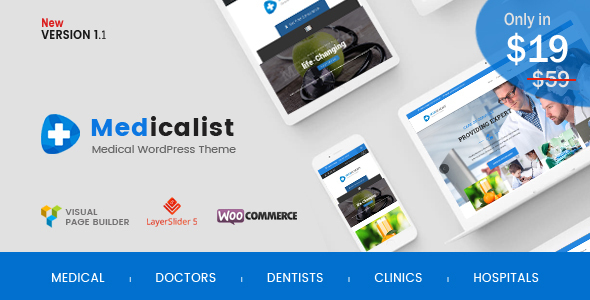 Medicalist is an easy to use, attractive, complex, interesting, and responsive medical health theme geared specifically to this website category. Medicalist is all about presenting your services and portfolio to the world and getting your audience to trust you. To simplify the process of creating layouts for your website, Medicalist gives you 6 full demos you can use anytime. What’s more, Medicalist offers 4 integrated premium plugins one for page building, one for creating sliders, one to allow visitors to make donations, and the last one to help you create an online store. To conclude, Medicalist has a bunch of useful customizations all medical websites need. Not all medical health themes can pull a combination of both professional and chic design but Medic does it well. Medic is a very customizable medical theme containing 2 timetables designs, appointment page, shortcodes, doctors post type, doctors page, departments, timetables, testimonials, custom page templates, unique header, and multilingual support. To help you navigate the theme and its options Medic offers complete video tutorials each one focusing on the theme’s major features. You can’t go wrong with Medic! 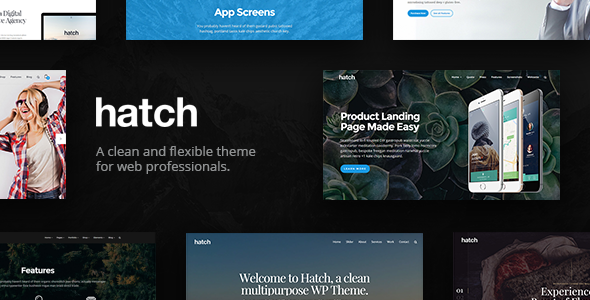 Hatch is a multipurpose WordPress theme that delivers on all ends starting with the design and finishing with its features. Hatch comes equipped with Visual Composer and 100+ elements, WooCommerce pages, styles, and features, drag and drop menu builder, 4 add-ons, complex typography, parallax backgrounds, page settings, Contact Form 7 integration, performance enhancement, cross-browser compatibility, and monthly updates. This theme is excellent for medical and health related websites looking for a smooth and intuitive design. When creating medical websites you have to search for medical health themes that have a professional and trust inspiring design. 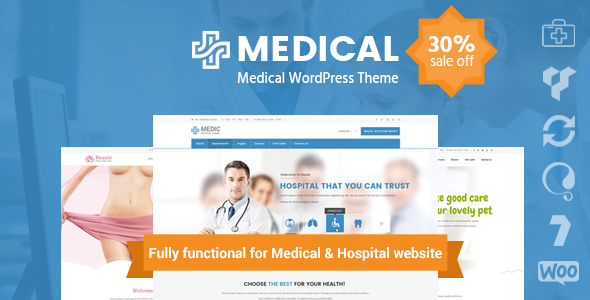 Medicom is the perfect theme to help you gain the trust of your visitors. With Medicom you can create custom page layout using the integrated page builder, add unique timetables, create responsive sliders, create mega menus, and offer directions to your location. Medicon has enough options to be highly customizable but no to overwhelm beginners which is a plus. Get Medicom! 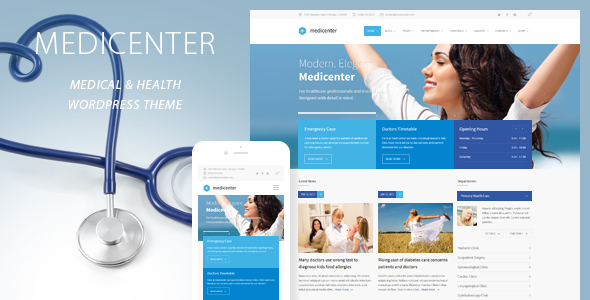 MediCenter is an eye-catching, impressive, well-designed, and visually pleasing medical health theme that focuses on the user experience. MediCenter incorporates a responsive layout, Slider Revolution integration, retina ready, timetables, smart sticky columns, custom page headers, color scheme manager, demo importer, page builder, 60+ content elements, content element settings, theme options panel, WooCommerce integration, premium icons, Ajax powered contact forms, right to left support, galleries, and 20 demo page templates. MediCenter will take good care of you and your website! 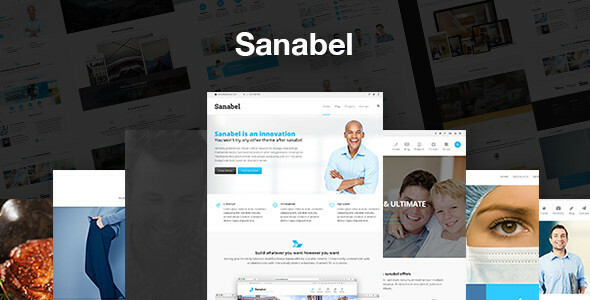 Sanabel deserves its place among the best medical health themes of the year thanks to its excellent and creative design. While it does not have as much features as some other themes of this list, Sanabel still has all the necessary tools to help its users build medical websites. Sanabel is packed with 10 ready to use demos, a retina ready and responsive design, powerful shortcodes, 2 slider plugins, 6 header variations, 11 footer combinations, unlimited sidebars, Google and web safe fonts, boxed and wide layouts, and child theme support. A really beautiful theme! Why Choose One of the Best Medical Health WordPress Themes on Out List? We live in the digital era, so services of any kind must strive to build a solid and professional-looking online presence. More importantly, a sleek and user-friendly website can improve your relationship with clients and maybe even win over some new ones. The themes above are a great choice for doctors, dentists, hospitals, health clinics, and any other type of health related websites out there. They are highly customizable, so you can tweak them to match your brand, and come packed with features that will help you get your site online without any help, in a matter of minutes. No need to hire designers or developers to give you a hand. Gorgeous design, great functionality, and advanced features. These are things all the best medical health WordPress themes on our list have in common. They were built with healthcare practitioners in mind, so there’s a good chance they will meet all your needs and enable you to create a website you and your patients can be proud of. If you’re in need of any other WordPress tips and tricks, keep browsing our blog or sign up for our newsletter. We’ll keep you up-to-date on everything WordPress. Really appreciate your hard work and thank you for this post.It really helps me. I would be very grateful if you could add imDoct , It has very amazing features.